Discussion in 'Latest US & World News' started by APACHERAT, Feb 9, 2019. California is in the middle of the pack debt-wise, but below national average. Texas has slightly higher debt (State+local) problem than California. Texas has no debt problem. In fact, we have s “rainy day fund” to cover emergencies like hurricanes. Dallas is ground zero for the Indian take-over of US businesses. Shame on them. Must have something to do with Eluzabeth Warren. I thought it was obvious. I have a client there where a good 95% of the IT department are from India, all the way from coders to supervisors, managers, directors and VPs. Right wingers who love states rights and self determination free from national government intrusionism should be applauding LA. That is, they would do so if they had any principle at all. US Citizens who love sovereignty and protection from foreign invasion should be appalled by the treasonous support of subjugation to foreign nationals expressed in the actions of the government officials in LA County and California. Subjugation...... Hard to take your posts seriously when you make comments like that. California's estimated total debt exceeds $1.3 trillion. They are fond of ignoring the unfunded pension liabilities of CalPers and CalStrs. In that case, let them go. You'd be a lot poorer because the most important industries are located in the blue areas, but you'd be happier being with your own kind. Who stands post and protects America and fights America's wars ? The majority who serve come from those red states. 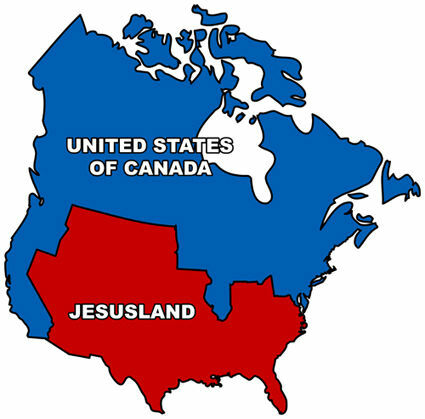 The Jesusland states are subsidized by federal tax revenue. If the US of C had the lost revenue back, they'd run large surpluses. Y'all are living off the economic success of the US of C states. Maybe it's time you earned your own way. I've lived up north (NY, IL, CT). Lots of stagnation and slums. Lots of people leaving and moving to: Virginia, North Carolina, Florida, and Texas! We are filled with immigrants from the rust belt, all finding a better quality of life. Dallas-Fort Worth adds 175,000 people every year. That’s more than Syracuse, NY. We’ll pass Chicago in about 15-20 years to be the third largest metro area. I see NY, IL, and CA license plates every day. Toyota just moved it’s headquarters from LA to Dallas. We are booming. ... are getting tax dollars through the federal government. You should let the people you don't like go. Yes, because that’s where the military bases are. Ditto NASA. Why do you hate Indians? And we’re able to keep afloat WITH NO INCOME TAX. Who said I hate them? Accusing others of hatred is an old liberal tactic. I think it is very unfortunate high paying / high tech jobs in US have been surrendered to foreigners. Unfortunately this is the kind of 'merit based' immigration the Donald Trump admin promotes. Sure, you charge massive property taxes instead (more than double of California). Every State collects their taxes one way or another. Florida doesn't have income tax either, but the property tax millage rates are quite high, especially in urban areas where the jobs are. Trump is on TV blaming Obama for not painting the current wall, while the obvious question why he hasn't painted them himself in the 2 years he has been in office. Huh? You don't like California, Oregon, Washington, New England, New York, etc. Let these states go rather than talk about building walls around them. You can keep NASA, Fort Hood, Fort Sam Houston, etc. California could keep Camp Pendleton, Edwards AFB, etc. You could even get a free trade deal, just not the tax transfers to your poor states. Can't help yourself can you? Glad I exposed you. As stated before, you've self-exposed an emotional/ irrational loathing of where you live. A Republican intensely unhappy and wishful for everyone to suffer for your hate. Neither patriot nor of sound mind. Please keep us updated on your departure and all the details on your new state home. Which Red state is waiting for your troubled soul? Isn't Obama's sequestration still in affect ? The Naval Academy is deteriorating so badly, its mission to train midshipmen is under threat. It could take millions to fix. Infrastructure at the naval institution in Annapolis has degraded to the point of threatening the school’s ability to train and educate midshipmen, according to a report by the Naval Audit Service. The 2018 audit, obtained by The Capital through a Freedom of Information Act request, details failing buildings, classrooms and athletic facilities — which in some cases actively leak, overheat and threaten user safety. You and your Suth'n Fried Poor Pals are soaking up tax transfers from the states you detest. Yes, it goes to our (federal) military bases. Our taxes are much lower than in the blue states. That’s a big reason why people are fleeing the blue states. My parents lived in Connecticut, where their local property tax was more than their house payment. And it wasn’t close. People in red states also give a higher percentage of their income to charity than the people in blue states. You don’t want to be a Salvation Army volunteer at Christmastime in NYC or Boston. I know you are intelligent based on some of your posts. So you know the 'writing is on the wall' that Texas will be a purple state maybe as soon as 2020. Sure.....Property tax in CT is 1.63%, which is lower than TX. Their house payment depend entirely on the size of their mortgage, so it is an irrelevant thing to mention.